What are Pull-Ups® Training Pants? Aren’t they the same as diapers? Pull-Ups® Training Pants are disposable training pants designed to look and fit more like underwear while working with your child’s potty training learning styles. Pull-Ups® training pants are designed to potty train by giving the child the independence to slide his pants on and off. But they are more than a training pant; they’re also a symbol to your child that it’s time to potty like a big kid. Going back and forth from diapers to training pants can lead to confusion and consistently putting them in Pull-Ups® will help make his potty training journey a more successful one. Pull-Ups® training pants brand created the training pants category in 1989. Pull-Ups® Training Pants are gender and size specific with a variety of products to match up to children’s various learning styles such as, Pull-Ups® Cool & Learn® Training Pants, and Pull-Ups® Learning Designs® Training Pants and Pull-Ups® Night*Time Training Pants. Why does my toddler need a training pant anyway? As much as potty training is an exciting adventure to begin, it can also be jarring for both toddler and Mom. Pulls-Ups® Training Pants helps provide a smoother transition between diapers and underwear, encouraging parents and children work together on this significant developmental milestone. Pull-Ups® Training Pants also offers superior protection and keeps accidents at bay for your toddler during the potty training journey. Aren’t disposable training pants harmful to the environment? Here at Kimberly-Clark we have a lot of resources in place along with an entire team dedicated to lowering our carbon footprint. Kimberly-Clark is proud to have been recognized for our sustainability leadership by the Dow Jones Sustainability Index. For more information on this topic, please visit www.Kimberly-Clark.com. How many different kinds of Pull-Ups® Training Pants are there? The Pull-Ups® Brand offers three different kinds of training pants: Pull-Ups® Cool & Learn®, Pull-Ups® Learning Designs®, and Pull-Ups® Night*Time Training Pants. Pull-Ups® Learning Designs® Training Pants have Disney characters on them that fade when wet – so kids see the difference between wet and dry. Pull-Ups® Night*Time Training Pants have Extra Absorbency so Mom and child can stay consistent during potty training – even at night. How much do Pull-Ups® Training Pants cost? Training pants prices vary by retailer. What sizes do Pull-Ups® Training Pants come in? Pull-Ups® Training Pants come in three sizes: 2T–3T (18-34 lbs. ), 3T–4T (32-40 lbs.) and 4T–5T (38+ lbs.). Pull-Ups® Night*Time Training Pants are available in two sizes: 2T–3T and 3T–4T. Where can consumers find Pull-Ups® Training Pants products (e.g. countries, retailers, etc.)? Pull-Ups® Training Pants are carried at a variety of national retailers, though specific products/quantities vary depending on location. Click here for more information. My toddler is fully potty trained in the day, but not at night. What to do? Congrats! You and your child have successfully done everything you possibly can on this potty training journey. The only thing to do now is wait while Mother Nature takes its course. Nighttime dryness is something toddlers grow into overtime as their bodies mature. While you wait, try Pull-Ups® Night*Time Training Pants to absorb wetness when accidents happen and keep sheets dry. If your child is a 4 or older, you may want to speak with your pediatrician and visit Pull-Ups.com for more information on nighttime wetting or bedwetting. What can I do to help my child with bedwetting? The best thing you can do for your child is to make them feel comfortable. Let them know you are not upset or disappointed, and consider products like Pull-Ups® Night*Time Training Pants and GoodNites® Youth Pants, which can help ease the stress of bedwetting. For more tips and information on bedwetting, visit GoodNites.com. Why is Pull-Ups® Training Pants creating a new approach to potty training? Pull-Ups® Training Pants has always noted that all kids train differently, and we are sharing why for the very first time in the brand’s history – because of their individual and unique personalities! This whole new way to train brings your child into the process as a true partner, tailored to his or her unique personality. The system focuses on how they learn, while using training pants designed specifically to help teach potty training skills. Visit Pull-Ups® Potty Partnership for more information. How do I know if my child is ready to start potty training? Potty training readiness varies for every family and child. There are behaviors and readiness signs that children may start to show around age two, like pulling at a wet diaper, hiding to pee or poop and staying dry throughout naps and nighttime. 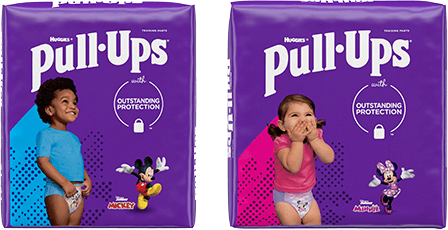 Take the Pull-Ups® Potty Training Readiness Quiz at Pull-Ups.com to help determine how interested your child is and when to get started. Can I use diapers during the Potty Training Partnership? While you may be tempted to use diapers while potty training because they’re more familiar to you, training pants help your toddler learn valuable skills like sliding pants on and off to use the toilet. Pull-Ups® Training Pants reinforce and build potty training skills, while boosting your child’s confidence. Visit Pull-Ups.com for more tips on potty training. How many steps are there in the partnership? What is the difference between Pull-Ups® Learning Designs® Training Pants and Pull-Ups® Cool & Learn® Training Pants? Because no two kids train alike, Pull-Ups® Training Pants Brand offers training pant options. Pull-Ups® Learning Designs® Training Pants have designs that fade when wet, to help kids learn to stay dry. Pull-Ups® Cool & Learn® Training Pants feel cool within seconds of becoming wet to help parents talk to their kids about potty training and teach their kids when they need to use the potty. How cool do the Cool & Learn® Training Pants get? The brief cool feeling of Pull-Ups® Cool & Learn® Training Pants is similar to the change you feel when touching water at room temperature. What are Pull-Ups® Cool & Learn® Training Pants? Exclusive to Pull-Ups®, Cool & Learn® Training Pants are an innovative potty training pant that gets cool on the inside within seconds of becoming wet. This cool feeling is an additional aid to help parents talk to their kids about potting training and teach their kids when they need to use the potty. Will Pull-Ups® Cool & Learn® Training Pants encourage child to go to bathroom by themselves? Pull-Ups® Cool & Learn® Training Pants are a training aid that will help you talk to your child about potty training, learning to stay dry by realizing when he or she went potty in the training pant. To further aid training, you can take your child to the potty and encourage them to try to use the potty so they won’t feel the brief coolness. It is important for parents to praise their children for positive behaviors – particularly when potty training. Can parents feel coolness on the outside of the pants? No. There is a white patch inside the pant that is in the target area that feels cool when wet, where it’s needed most for your child to feel cool. The coolness feeling is brief and can only be noticed for a few minutes after wetting the pant, and only after the first wetting. I think my child is something different than the quiz answers we received, what should I do? You know your child best. Read about the different personalities to learn other potty training tips. Go with your instinct and do what works for you and your child for a successful potty training journey. Why should I believe this personality quiz? The personality quiz is based on years of research on infant and toddler temperament and personality. The results will help you customize the potty training journey, making tips more specific and helpful based on a child’s strengths. The entire program is rooted in science and research, following the principles of experiential learning and our observations of personalities in young children.